A lamb and beef stockjudging competition for Young Farmers is helping to find the next generation of livestock farmers at this year’s English Winter Fair in Staffordshire. NFYFC's live and carcase competition, which is sponsored by EBLEX, is aimed at developing young farmers’ stockjudging skills. The competition, hosted by Staffordshire and Birmingham Agricultural Society, runs from the 16-17 November at Staffordshire County Showground during the English Winter Fair, and involves 24 teams of Young Farmers from 13 counties throughout England and Wales. It is an opportunity for YFC members to put months of training to the test by judging high quality livestock and carcases and presenting their findings to industry experts. 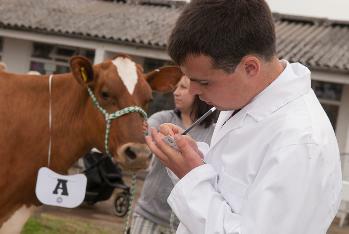 The competitors will be required to judge cattle and sheep, and order them in terms of merit, as well as judging and classifying beef and lamb carcasses. Sponsor EBLEX has been working closely with NFYFC to produce stockjudging guides and dvd clips to help YFC members develop their skills. The organisation also supports YFCs with Meat for the Market training events to teach members how to produce meat for today’s market. “‘EBLEX are supporting the NFYFC’s stockjudging competition because the next generation of beef and lamb producers are very important to us. Being able to select stock at the correct time for slaughter, when finished but not fat is important on all farms to maximise profitability." “Good stock judging skills are increasingly important in livestock farming and this competition combined with the fantastic resources EBLEX has produced will really help YFC members to develop these vital skills. All competitiors in the NFYFC competition and Staffordshire FYFC competitions at the English Winter Fair are invited to attend a three course meal on Saturday 16th November from 8pm onwards. Tickets cost just £10 per person and include admission to the Herdsman's Supper Disco at 9.30pm. To book tickets contact Julia Taylor on 01785 248645 by Monday 11th November.